A week before we knew Willa had a tumor growing in her right eye, I was asked to lead our women’s group at the start of April. At the time, I had no idea what I would focus the evening on. This blog and all of its readers has been such a part of what I’ve experienced and how I’ve grown that I realized there was no way I wasn’t going to share our time this evening here on the blog for everyone to take part. that I would hear it and I would know it and trust in it with my whole being. Trust that He will not abandon me. He will accomplish what He began. “He who began a good work in me will carry it on to completion until the day of Christ Jesus.” Philippians 1:6. So let’s share together the hope that we have and remind one another of who it is we boast in and why. All we deserve from him(God) is judgment. Therefore every breath we take, every time our heart beats, every day that the sun rises, every moment we see with our eyes or hear with our ears or speak with our mouths or walk with our legs is free and undeserved gift to sinners who deserve only judgment. One of the reasons we are not as Christ-centered and cross-saturated as we should be is that we have not realized that everything – everything good and every thing bad that God turns for the good of his redeemed children was purchased by the death of Christ for us. We simply take life and breath and health and friends and everything for granted. We think it is ours by right. But the fact is that it is not ours by right. We are doubly undeserving of it. 1) We are creatures and our Creator was not bound or obligated to give us anything – not life or health and anything. He gives, he takes, and he does us no injustice. 2) And besides being creatures with no claim on our Creator, we are sinners. We have fallen short of his glory. We have ignored him and disobeyed him and failed to love him and trust him. The wrath of his justice is kindled against us. All we deserve from him is judgment. Therefore every breath we take, every time our heart beats, every day that the sun rises, every moment we see with our eyes or hear with our ears or speak with our mouths or walk with our legs is free and undeserved gift to sinners who deserve only judgment. And who bought these gifts for us? Jesus Christ. And how did he purchase them? By his blood. It might sound crazy to hear/read those words…..as I watched Willa screaming while 5 nurses held her down to try to get an IV needle started over and over again, as I witnessed tiny little limp bodies lying in gigantic hospital beds, clutching stuffed animals and mothers and fathers kneeling at their bedside, gently coaxing them awake from anesthesia, as I watched frail teenagers being wheeled by their parents through the hospital…..those words, that confess that all we deserve is judgment, are the only way I can make sense of the suffering….that me and Steven and Willa and every being on this earth are doubly undeserving..that to even exist is an extravagant grace. An extravagant grace that our Heavenly Father lavishes upon us even while we are still sinners! It’s the moment when I’m blissfully lost in this truth that I can boast in the cross of Christ, in Jesus’ death and resurrection. It’s in those moments that I feel like this boasting was all I was ever created to do. It’s all I’ll ever want to do. It’s worth eternities of praise! It’s my whole life, my whole being. Oh! That those moments lingered. But, the struggle is real and my heart is faint. That’s why reminders are so precious. Because we’re all walking different roads and while one is pressing ahead, full of grace, another is dragging behind, weighted down with apathy. So we pass the baton of remembrance, we raise our Ebenezers…thus far the Lord has helped us! Look and see and remember. 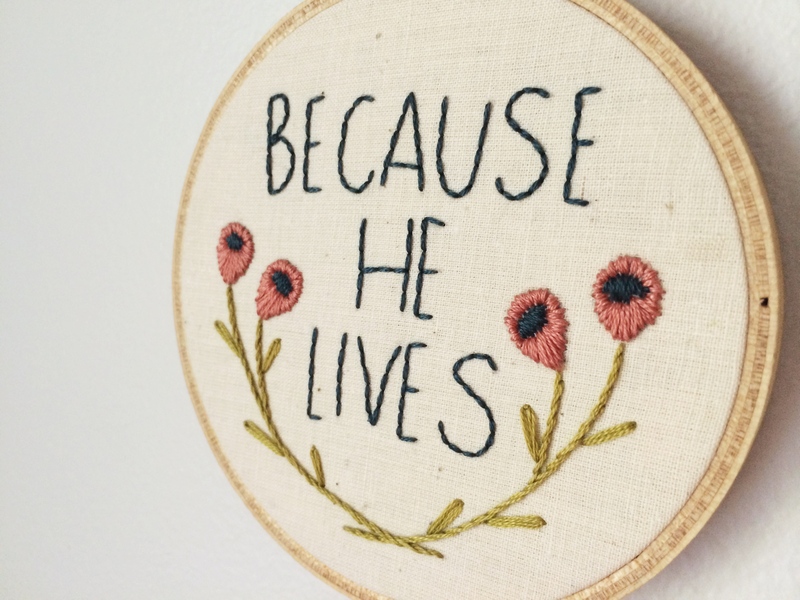 BECAUSE HE LIVES! My (and your) Ebenezer this Easter weekend. Because HE lives….I joyfully endure the reality of childhood cancer. So, fill in the blank: Because HE lives…..
What has the death and resurrection of christ secured for you? Raise it high! Be reminded that everything was obtained for us by the cross of Christ and that you are alive only because HE lives. Here I raise my Ebenezer, Here by Thy great help I’ve come! 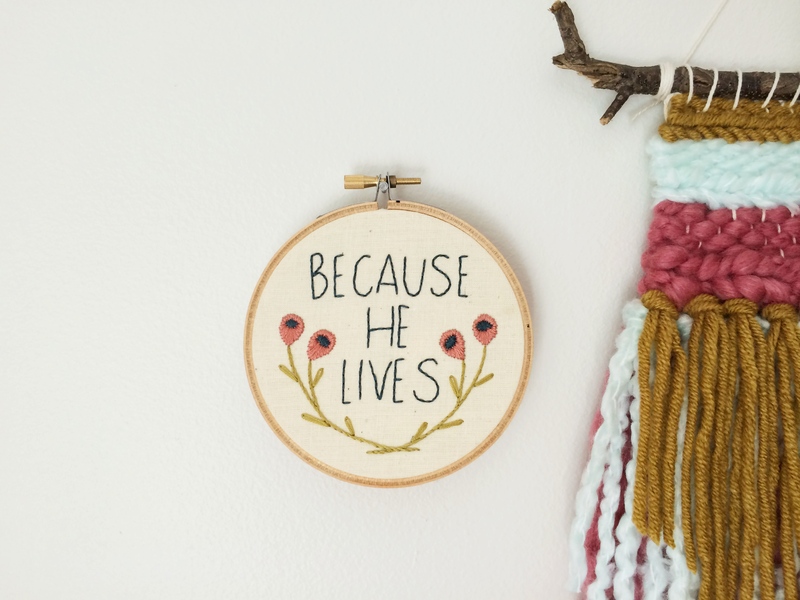 If you’re interested in stitching your own “Because HE lives” embroidery hoop as an Ebenezer/reminder of His help, you can use the pattern below. 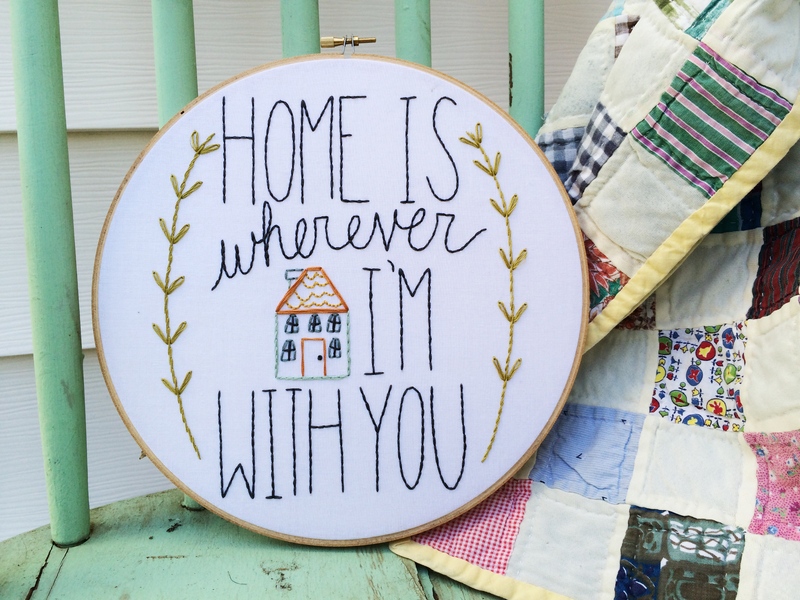 It was originally create for a 4″ hoop, but you can tweak the size of the image to fit whatever size you’d like. Use different stitches and/or colors if you’d like to give it your own unique twist. Thank you, this was such a blessing to read. May God continue to bless your family and precious Willa. Because He Lives we have a great Hope. When my precious husband was dying of cancer his only request of me was to help him keep his eyes fixed on Christ. We have great peace because He Lives! May God bless you, Steven, and the precious children he has placed in your care. Because He lives I can have assurance that my family sweet family of four – because we have all trusted Christ – will live forever. I’m thankful for His free gift of salvation and of eternal life. Thank you for the precious embroidery pattern. I really plan on making it! I can crochet and cross-stitch but have wanted to expand my stitching to embroidering and was just talking to a lady at church who does it as a side job the other day. (I’ve also pinned several things lately. 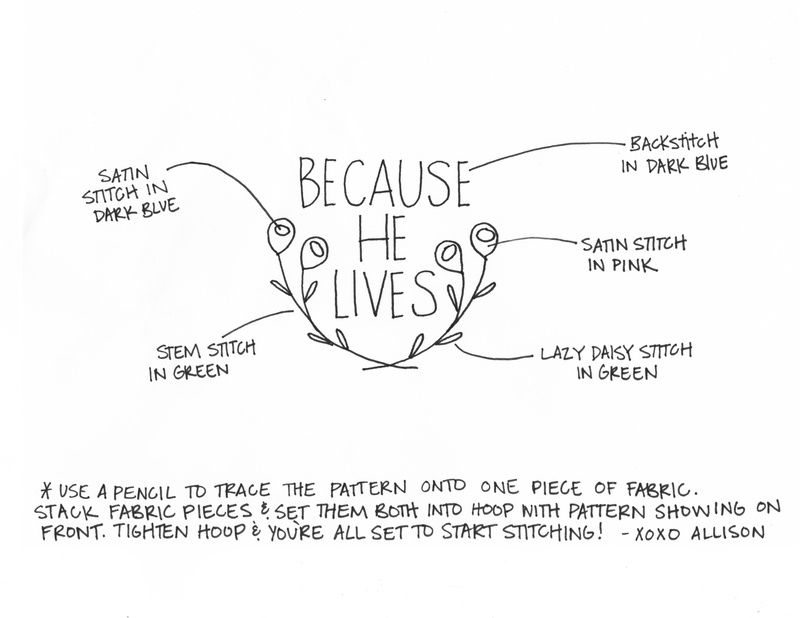 lol) I’m going to pin this post (and hope others will come for the free pattern but be inspired by your story).